Editor’s Note: This post is one of Convince & Convert’s Top 10 Posts of 2016. Wouldn’t it be great to take a peek inside the minds of really smart marketers and borrow their brilliant ideas? Because that’s how I convinced my boss to start Real Smart Marketing, a video series where top influencers record bite-sized marketing advice. As a content marketer, I’m dying to know what these experts think will happen, and how to best prepare for it. 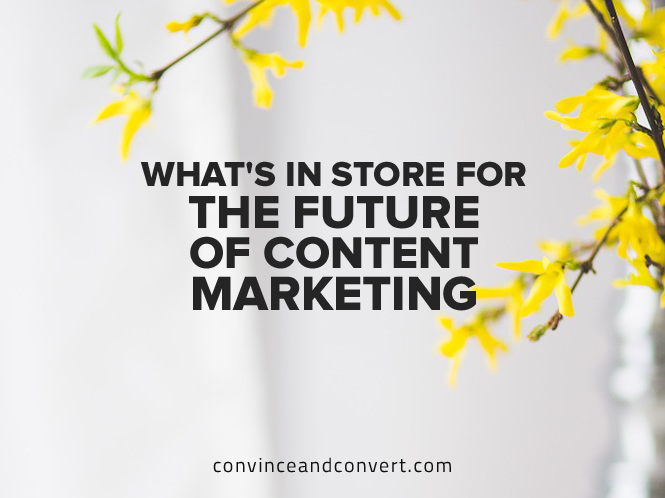 How Will Content Marketing Evolve in 2017? Let’s ignore those two comments for a second and get into things we can do something about. Content marketing has mainly been about blogging, ebooks, and other written content types that generate email subscribers. These strategies continue to prevail, but brands will need to be more creative with their content’s formats to break through the noise. Visual content will become more important as search engines get better at reading and analyzing images to determine what your website is about. More gifs—yay! With more new entrants into the saturated pool of content marketing in 2017, we need to stop going high-level and start getting down to the nitty-gritty. For example, rather than writing a blog post about “how to attract customers online,” you’re better off writing about “how to attract returning customers through Facebook Ads.” Scratching the surface of an over-discussed topic won’t help you stand out. Why should people read your post instead of thousands of others? Serve a niche audience, and go deep into the rabbit hole. We love videos. That’s why we started this series. Marketers agree that videos bring the highest ROI, and we’re doing more of it. According to Syndacast, 74 percent of all traffic will be video in 2017. Social video platforms like Facebook are riding the tide and optimizing feeds to improve the viewing experience. Having more videos also improves SEO, as Google—which owns YouTube—favors them in search results. So get your cameras out and start filming. We already know brands are spending more on content marketing than advertising. This trend is likely to continue in 2017. In fact, Sam from HubSpot predicts that this trend will lead publications that generate leads with content marketing to buy out those monetizing with ads. Content marketing is more cost-effective than other forms of marketing, such as ads, and companies are getting better at attributing dollar value to content marketing properly. Looks like we’re gonna keep our jobs for a little longer, content marketers. Content marketers have gotten good at acquisition, but we’re not very focused on retention. In 2017, we’ll need to shift our focus to driving growth within existing audiences—like measuring daily or weekly active users to ensure consistent engagement until conversion. Instead of just bringing you to this blog post, we should optimize it so that you engage, subscribe, and keep coming back. So there you have it. In 2017, content marketing is going to be alive and thriving, but more work, more challenging, and harder to get results. I suppose we just have to be real smart about it. See what I did there? As I mentioned, we’re doing a series of videos like this one. Subscribe to our YouTube channel to make sure you don’t miss the next video, with cool guests you probably should listen to, answering a question you probably need to ask. If you liked the video, give it a thumbs up or share it with your friends and colleagues! Joei is a Content Marketer at Mention, where she turns dry, uninspired content to engaging narratives. Or at least she tries to. Is usually eating otherwise.